Editor’s Note: In light of the recent controversy surrounding the NFL’s handling of Junior Seau’s Hall of Fame induction ceremony and a new settlement challenging the terms of NFL’s concussion settlement that was filed in a U.S. Circuit Court by 10 former players, I have updated an article I wrote on Traumatic Brain Injury in sports in 2012 to reflect some of the more significant developments of the last 3 years. In early autumn of 2012, the Kansas City Chiefs were a 1-3 football team with little prospect of crawling out of the AFC West cellar. They found themselves hosting the perennial powerhouse Baltimore Ravens in Week 5 and, even though they kept it a one score game going into the 4th quarter, few of the 70,000+ in attendance at Arrowhead Stadium had much faith that their Chiefs would come away with a W. This was due in part to the struggles of Kansas City’s quarterback, Matt Cassel, who had been underwhelming during his brief tenure as the team’s signal caller. With about 10 minutes left to go in the game, Cassel dumped a screen pass to running back Jamaal Charles right before getting blown up by all 330 lbs of Ravens defensive tackle Haloti Ngata. After the play was whistled dead, Cassel lay on the ground, disoriented and writhing in pain from the massive hit he had just taken. Eventually, Cassel became motionless on the turf as Chiefs trainers came to attend to him. While this was all happening, many of the fans in Kansas City had begun to cheer the injury to their much maligned quarterback, serenading Cassel with a chorus of ironic hurrahs. After the game was over, Kansas City offensive lineman Eric Winston launched into an eloquent locker room rant to reporters about how sickened he was to hear Chiefs fans cheer the injury of one of their players. In a rare moment of reflective candor from a professional athlete, Winston–who is now the President of the National Football League Player’s Association–acknowledged the fact that he probably wasn’t going to live as long because he has chosen to play such a violent game, but that he had made his peace with that. With that said, Winston reminded the reporters present that, “this is not the Roman Colosseum” and that exulting in another human being getting knocked out is disgusting. Much has been made over the past few years about the long and short term impact of Traumatic Brain Injury (TBI) on professional athletes, especially in high impact sports like football and hockey. In the past, concussions had been treated with little more than a “how many fingers am I holding up” approach. If a player could pass a number of often arbitrary tests given to him by his trainer he was often let back in the game a few plays later. After pressure from the medical community and players’ rights groups, along with a series of player suicides directly or tangentially linked to TBI, the NFL has been forced to begrudgingly acknowledge the long term effects of brain injury. The NHL, which is in the middle of fighting a class-action lawsuit brought by 80 former players regarding the league’s treatment of TBI, has dragged its heels even more than the NFL, still refusing to accept a mountain of scientific evidence that links concussions and non-concussive TBI with long term brain damage and suicidality. In May of 2011, Minnesota Wild enforcer Derek Boogard was found dead of an overdose of alcohol and oxycodone at the age of 28, becoming the third enforcer in very short period of time to die of an overdose or commit suicide. In hockey, the enforcer’s role is to be the heavy and fight all of the team’s fights, which results in an inordinate amount of TBI. After his death, researchers at the Bedford V.A. 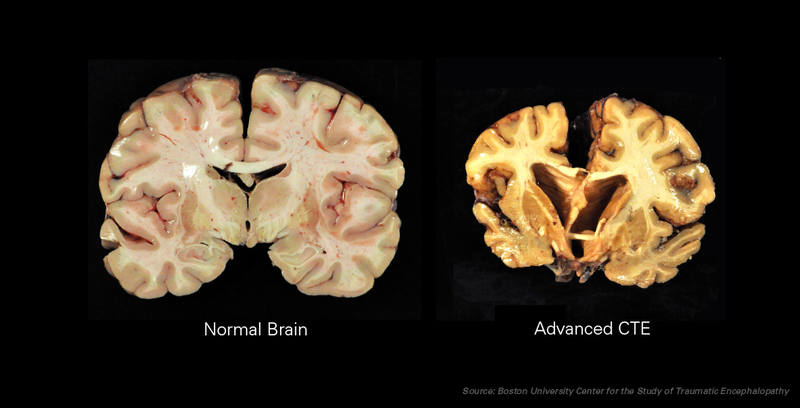 Medical Center examined his brain and found a staggeringly developed case of Chronic Traumatic Encephalopathy (CTE), a degenerative brain disease that is thought to occur from repeated blows to the head and which has been found in scores of deceased athletes. What was remarkable about Boogard’s case is that all of his damage had occurred before he had the chance to turn thirty, showing that significant mood-altering behaviors can possibly be the result of brain damage in athletes in the primes of their careers. “I got to go. I can’t be here.” Those were the last words of former Kansas City Chiefs linebacker Jovan Belcher, spoken in the parking lot of the team’s practice facility on the morning of December 1, 2012. Less than an hour earlier, Belcher had murdered his girlfriend, Kasandra Perkins, shooting her 9 times during an argument at their suburban Kansas City home. Belcher’s mother, who was living with her son at the time and helping take care of his 3 month old daughter, ran into the couple’s bedroom and found her son kneeling on the floor beside Perkins, begging her for forgiveness as she bled out. After kissing his girlfriend on the forehead, he did the same with his infant daughter and apologized to his mother before leaving the house and ending his life with a gunshot to the temple in front of the Chief’s general manager and head coach. Jovan Belcher was only 25 years old. In the years since Benoit’s death–and even in the short time since those of Jovan Belcher and Kasandra Perkins–a good deal has been done to raise awareness around the dangers of Traumatic Brain Injury. In 2013, PBS’s Frontline aired League of Denial, a 2-hour documentary on the concussion crisis in the NFL that focused as much on the league’s systematic cover-up of research behind CTE as much as the disease itself and, earlier this year, stand-out San Francisco 49ers linebacker Chris Borland announced he was retiring from the game of football at the age of 25 to preemptively stave off the damage that could potentially be done to his brain over the length of his career. At the present time, it doesn’t seem as if the furor over TBI has had any effect over the NFL’s bottom line. The controversy surrounding the league’s handling and attempted censorship of Junior Seau’s Hall of Fame enshrinement ceremony didn’t stop the first NFL preseason game between the Minnesota Vikings and Pittsburgh Steelers from being that week’s top rated broadcast, but it certainly looms large over the long-term future of the sport. The wave of litigation that will be filed against organizations like the NFL and NHL is nowhere near cresting and, perhaps more importantly, neurologists are beginning to discover that playing sports like football in elementary school can lead to disruptions in brain development that are associated with cognitive issues later in life. The Pandora’s Box of Traumatic Brain Injury has been opened and what we find out in the years to come can only solidify and expand open the existing research that shows the neurological havoc that can be wrought by even short-term participation in high contact athletics. Going forward the question will not be whether these sports cause brain damage, but if we as a society care enough to do anything about it.